I spent the day at Johnson Lake Recreation Area between Ninilchik and Soldotna today at an event called "Celebrate Salmon". There were 15 stations run by Kenai Peninsula 6th grade students, Fish and Game staff, Forest Service personnel, among others. As I wandered around chaperoning McNeil's fourth grade class, something struck me: the high number of muck boots. 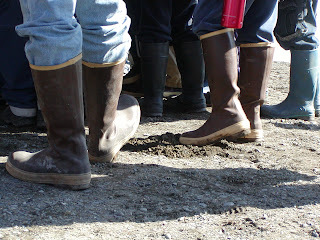 I would say at least 75% of the people at this event (parents, teachers and students) had on muck boots. This is one of the most "Alaska" things I have come across. I asked my daughter if it was just my imagination, and did anyone wear muck boots in Michigan? She said, "Nobody." I bought my muck boots at Walmart when I went to Michigan during spring break, thinking they would be quite a bit cheaper there than up here. They were only $2 less than a more heavy duty pair I'd been looking at buying in Homer. Since I brought my muck boots home I have discovered a measure of freedom I've never had before. Mud means nothing now. In Michigan I wouldn't go for walks when it was muddy, or I would find a paved road. Now it doesn't matter how mucky it is, I can walk in peace. Of course, my kids wear muck boots, but they still come home muddy. I don't think they try to keep their clothes clean like I do! The irony of seeing all those muck boots today, though, is that for once we didn't need them! I admit we still point out bald eagles flying overhead to each other most of the time, which marks us as less seasoned Alaskans. I see them many times a day, perched on dead trees usually, or cruising along like they're headed somewhere. It is neat when they fly over so low that I can see their head moving back and forth as they scan the ground like the one that flew over my head last Wednesday as I sat on Bishop's Beach. Eagles nests are everywhere, and very often the eagle is perched on the tree next to the nest. 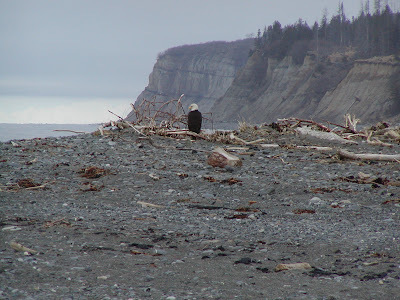 Last week on my way to Ninilchik I saw two eagles heads peeping over the edge of a nest along the Sterling Highway. I'd never seen eagles in a nest before. At first I thought they were babies, but when I started thinking about how big the nest was, I realized they'd have to be full-grown birds for me to be able to see their heads as I drove along at 55 mph. Plus, they don't get their distinctive white head and black bodies until they're a year old. On my drive in to Homer, there is a big tree right next to a house that I often see two eagles perched on. They are always there together; never once has there only been one eagle on that tree. The picture above was taken this morning on Bishop's Beach. These birds are so unafraid of people that you can often walk near them, though we try not to disturb them since this is really their territory more than ours. It is nice to have them around, and we appreciate their sharing space with us. 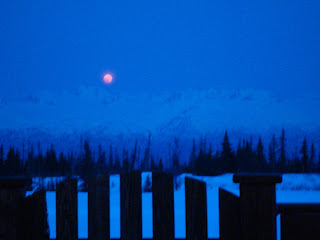 My aunt and uncle in Ninilchik remember waking up in the middle of the night during the 1986 eruption of Augustine (and others) and thinking it was the end of the world: the sky was an eerie red with flashes of lightning and they had no idea what was going on. It wasn't until hours later when the ash began to fall that they figured out what was going on. 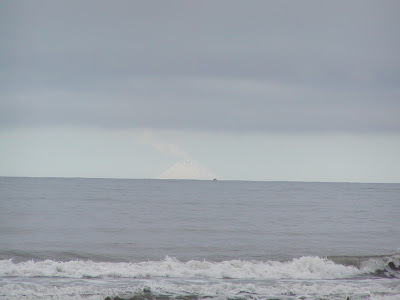 A small tsunami was created during those eruptions. I am glad I know what their experience was like in case it happens when we're here. Last weekend Denver's Cub Scout troop had a rock climbing outing on the climbing wall at Homer High School. Climbing walls aren't that unusual anymore, but what made this fun was that the person who runs climbing instruction on this wall is a real climber. "Fuzzy" is the guy in charge (he is belaying for Aurora in this picture--the one holding the red rope), and one look at his hands and you can tell that he is the real thing. Rough does not even begin to describe them; tatters might be more accurate. He is a tiny whip of a man, with fuzzy hair and a misshapen face which just might be from a climbing accident. The kids got to climb 2 or 3 times each during the hour (and they were generous enough to let my daughter climb, even though she is not a Cub Scout!). Near the end Fuzzy asked me if I wanted to climb. I jumped at the chance and felt pretty comfortable on the wall considering I haven't climbed in the 15 years since college. When Fuzzy did the final climb of the day, though, it made everyone else look like bumbling 2-year-olds. He chose a route up using only one color of rock outcrops and he lunged from one rock to the next. While speed is not always the hallmark of a good climber, Fuzzy looked quite at home zipping up to the ceiling in less than 2 minutes despite being a 50-something guy. Next time I see Fuzzy I'll get a picture of his hands; they are works of art. There are some things I just never liked when I lived in Michigan that I really love now. As I started thinking about it I realized that many of the things are representative of life in Alaska, so I decided to share my list. 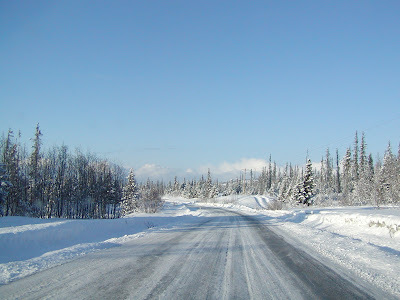 Three things that never crossed my mind as liking before I moved here were guns, 4-wheelers and studded tires. Now I could wax eloquent on those topics; you don't want to get me started! And I hate to think of life without my .44, driving without studs or not tooling around on a 4-wheeler. My husband brags that now I'm a meat eater. All my life I have bordered on being vegetarian, but meat up here has been so cheap for us (a free moose, and fresh, organic, grass-fed cow for under $3/lb. from our neighbor), and tastes better than any meat I've ever had in my life, that I now rave about steaks and burger. Along with eating meat, I now have a cast iron frypan, another stranger in my previous life, but a good friend I'd hate to cook without, and a grill that sees regular use. And homemade food from scratch is the way to go. Why pay the premium grocery stores charge for convenience food when I can make spaghetti sauce, pizza sauce, bread, waffles, pancakes and everything else in between from scratch for a fraction of the cost? It just makes sense to cook that way with groceries being as expensive as they are. I have also joined 2 natural foods buying clubs that order food bulk from Seattle, something I thought only radicals did (Hm. Maybe I am one now??). The food is cheaper, and healthier too. Shopping happens through an online catalog rather than in a building. Other miscellaneous things I now like, that I either never noticed before or actively disliked: log homes, hardwood floors, walking in the mud (just get muck boots! ), a 30 minute commute to town (gorgeous scenery helps), and playing cribbage. 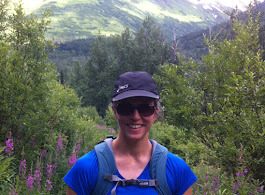 A few things I like more now that I am here: cross-country skiing, backpacking, playing cards & games and sunshine. Am I a radically different person now that these things are part of my life? I don't think so. Many things on my list are simply adaptations to life here, while others are tools we use. Does every Alaskan have or like these things? Definitely not, but it seems like more of them do than I ran across in Michigan. Moonrise (top picture above) is pretty late--I took this at 10:30 p.m. last night and it was still light enough out to actually get a picture (unprofessional photographers that we are). Sunrise was at 6:45 this morning. We've turned the heat off in the house and it is getting into the 70's inside during the day now (way too hot for us, so we open the windows); the long days are giving off plenty of solar power. 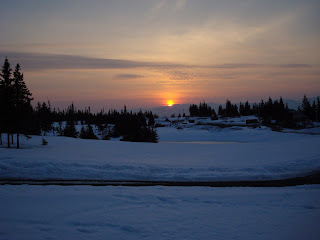 The snow is finally melting, though we did have some perfect spring skiing in t-shirts on Friday. At this rate I'll have an awesome tan before summer gets here! Speaking of solar power, I planted broccoli, cauliflower, cabbage and herbs in flats on Friday afternoon, watered them and covered them w/saran wrap. This afternoon (only 2 days later!!) all but the herbs were pushing their way up out of the soil. The long hours of sunlight can result in legginess, so while it is wonderful to have sunshine, it can produce tall, weak plants so I have to keep an eye on them. I'll put them in the basement overnight where it is cooler to slow them down a bit. More on gardening in another blog entry soon! Car derelicts like this one are not an uncommon sight along highways on the Kenai Peninsula. As the snow begins to melt, more and more car carcasses are revealed. The first time or two I saw a car wreck sitting on the side of the road and obviously not going anywhere soon I was startled, since that's not something I've seen before, but now I am getting used to seeing them. There's one wreck on the Sterling Highway south of Soldotna that all the doors are open and it looks like it has been pillaged. It has been there all winter. This one is on East End Road about Mile 10 and I took it a few days ago (to give you an idea of the size of the snowbanks...still plenty big!). Not everything in Alaska is beautiful, but the things that aren't beautiful are interesting! We had a beautiful 6-8 inches of fresh snow this week, to make for dream skiing conditions, and as you can see from these pictures of East End Road, it is beautiful too! It was powder, and it made me realize how lucky we are to have such awesome spring skiing (snowshoing, sledding, etc.). 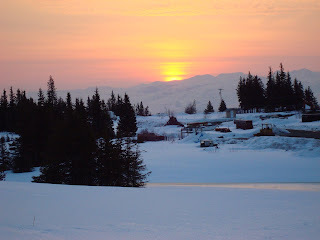 I've been reading about high level downhill and cross-country skiers really looking forward to spring skiing in Alaska, and I didn't understand why, but with 3 feet of snow on the ground at elevation (more in other places), a crust to keep from sinking in, and warm days when it is sunny, now I understand. My kids can finally spend hours playing outside before it gets dark (the sun setting at almost 9:00 now), and if it is sunny it is warm. The difference between sunny and cloudy is startling, though, as I discovered yesterday. I was out sledding with the kids in the sunshine with only a light jacket on and I was hot. An hour later when I went for a walk the sun was behind clouds, I had my winter jacket on, and I was cold. Cross-country ski club at McNeil Canyon School is still going strong, and continues to until the snow is gone. Never mind that I was planting my garden in Michigan at this time!! All my life I have thought people who got car sick had extremely delicate stomachs and were, quite honestly, wimpy. 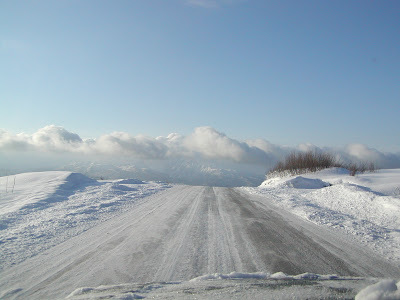 Since moving to Alaska, I have gotten car sick more times than I care to recall. I blame East End Road, our link to civilization. Up to about mile 10, this road has long, straight stretches that climb up to McNeil Canyon School. About a mile past the school, though, the road narrows, gets rough and begins a twisting and turning that sends my stomach roiling. This is the area I get car sick. It happens most often if I have just eaten, and is worse if I'm looking down. Saturday I decided to treat the kids to reading a book aloud on the way home from town, something I have done for years in the car. I was fine, until we hit the curvy section. All of a sudden, it hit me. I needed the window open--fast! Now, I've never actually upchucked; it's always an incredible roiling in my stomach. The funny thing is, as soon as we get off the curvy roads (whichever direction we're going-home or to town), my upset stomach is history and I promptly forget it.